The HTC Desire is, in effect, the second in the new Android range from HTC, with its much larger brother, the HTC Desire HD, taking most of the limelight. But it's more than 'spare a thought' for the HTC Desire Z, as this phone is designed to encompass the best Android has to offer with HTC's sublime Sense overlay - and a QWERTY keyboard to boot. The first thing you'll notice about the HTC Desire Z when you pick it up is the sheer heft, as we're seeing a phone with a 3.7-inch screen coupled with a not-insubstantial QWERTY keyboard and hinge underneath. The whole unit weighs in at 180g, which isn't the lightest on the market, and you can certainly feel it in your pocket... but it's not so bad that if you're hungry for a QWERTY keyboard you won't be able to tolerate it. The Desire Z itself feels pretty high end, as it's clad in aluminium and has a nice and polished feel to it. The battery cover on the back is well-designed and complements the design well, and pops off with a pleasant jump when using the switch on the side. 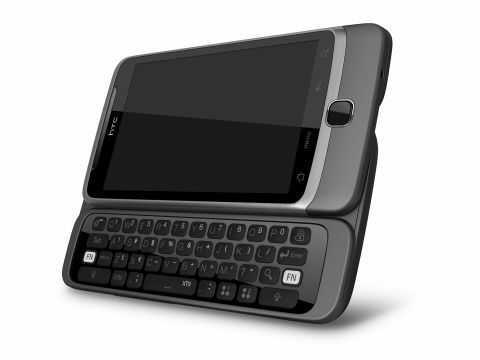 The front of the phone looks different to the HTC Desire HD, with the usual four touch-sensitive keys (home, menu, back and search) above a clickable optical trackpad that lets you negotiate text and also doubles as an enter key. The left-hand side of the phone holds the large volume rocker switch, and the microUSB slot, which is uncovered. The right-hand side only has the aforementioned battery cover release and the physical camera button - which we're really pleased to see after it was left off the Desire HD. The top of the phone hold the power/lock key, and it's much more prominent than others in the HTC range, and it's really easy to hit to open up the phone. The 3.5mm headphone jack is also situated here, and is nicely positioned to not get in the way when you're watching videos through wired headphones. The slide out keyboard has a lovely motion too, as it doesn't glide out; instead, it folds out on itself, lifting and dropping into place. The QWERTY keys themselves are large and easy enough to hit, but not raised enough nor have enough travel to really allow super-fast typing in our opinion. The keyboard also packs another problem: the hinge is really loose, and the screen wobbles under touch input when the keyboard is stowed away. And when open and held vertically, a few shakes can see the screen rock back easily onto your thumbs, which is really not what we'd expect from a device of this class. Sure, it's not going to happen that often, but we'd certainly expected more from the build quality on a device designed by HTC.